Oklahoma was the last state with a prohibition on tattooing. It wasn’t until 2006 that tattooing was legalized, when Governor Brad Henry signed legislation revoking the ban. Today, expert artists across the state are setting up shop. From Oklahoma City shops combined with art galleries, to wonderfully stylized parlors in neighboring towns, you’ll find exactly what you’re looking for. Here are 10 awesome tattoo parlors in the state. Minder Bender is not only a tattoo shop, but also a fine art gallery. The artists who tattoo are also skilled artists in other mediums. Jay MF Roberts is a very talented artist with a unique style of his own. Spaded and Jaded was established in 2008, but artwork looks as if the artists have been practicing for many more years. They offer thousands of ideas and can rework old tattoos that might be associated with not so great memories. Steven Rudd has a great reputation in town as a tattoo artist and he does beautiful work. There is a nice album of his work on their Facebook page. 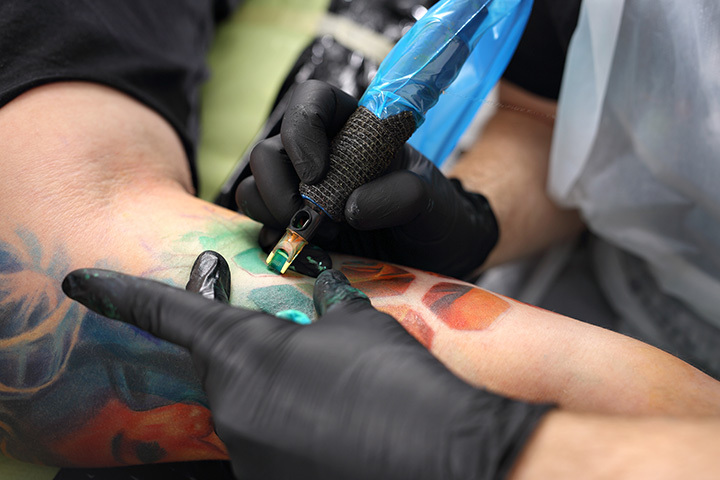 Black Magic Tattoo is located in Automobile Alley, but you should visit it because the artists want to make sure you enjoy your tattoo for the rest of your life. According to its website, Elite Skin Art was the first legally licensed tattoo shop in Oklahoma. Reviewers on Facebook say the atmosphere is inviting and clean. The artists are professional and knowledgeable. Deep Ink Tattoos has two locations after just five years in business. Browse through their Facebook photo album for ideas or just to see their fabulous work. Cannibal Graphics is an upscale tattoo shop that is very popular. It opened in 2006 and has five artists, each with their own aesthetic and style. Call before just stopping by to make sure the artist you’re interested in has time to consult with you. This custom tattoo studio bills itself as the most exclusive tattoo shop in Oklahoma. The artists love to create custom pieces. The atmosphere is relaxing, comfortable, clean and safe. Studio Ink not only has excellent Google and Facebook reviews, they have a definite presence in the community. Last year, they took their skills to an alley that was having a graffiti problem. The artists transformed the alley into an art show. Atomic Lotus Tattoo has found itself on the Best of OKC list every year since 2006. The shop brings in guest artists to help the local artists stay fresh in the industry. Be sure to check out their website for lots of good information about getting a tattoo.